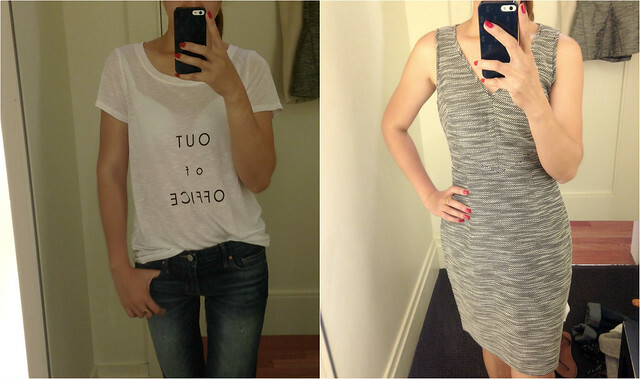 There are so many great sales this weekend so I thought I'd quickly share some fitting room pics just in case you're interested. Labor Day weekend is a great opportunity to score some end-of-summer deals as well as new Fall arrivals. 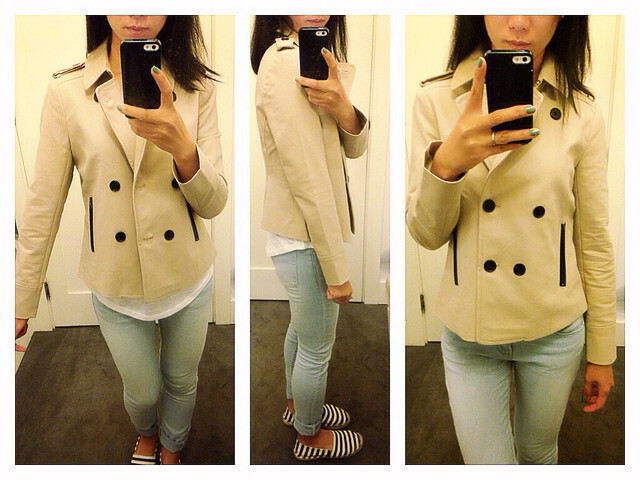 I went shopping specially looking for a lightweight jacket for Fall. Hope you'll find this post helpful and I will update the blog with steals and deals throughout the weekend. ***UPDATE**Banana Republic: Take$75 off $150, $40 off $100, $25 off $75 with code BRWEEKEND. First up is this boiled wool moto jacket - The jacket is beautifully constructed and the material has substantial weight. Loved the gold details. I tried on a 00P and couldn't have asked for a better fit. 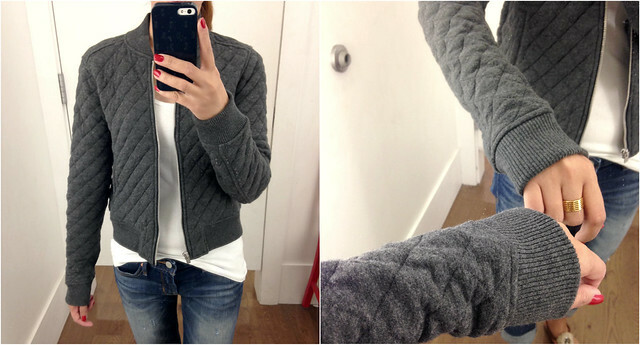 I personal think this jacket is even doable in mild winter with a sweater underneath. I am not a fan of boiled wool fabric. Lapels didn't lay flat when unzipped for some reason. 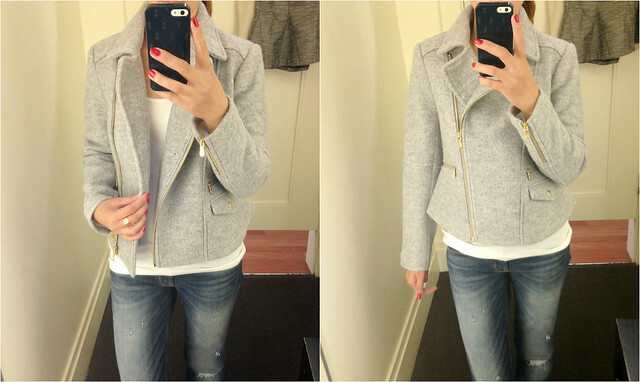 Banana Republic textured moto jacket ***UPDATE: This jacket is now on sale in petite sizes. Regular sizes are still full-price. Can be combined with code "BRWEEKEND" - size 0 regular: This is my favorite item out of the bunch I tried on. Loved the soft material. My local store doesn't carry this jacket in petite sizes. I am wearing a size 0 regular here and it was a tad big thoughout. I am going to place an order online and will keep you posted. I can see myself wearing this jacket to work as well as out on the weekends. Saw this adorable tee in-store but for some reason, it's not available online. Loved the fit but it's obviously too sheer. I would have brought it if the material was thicker. Banana Republic piped tweed sheath dress - size 00P: Again, this dress fits me really well. It's one of those classic dresses that can be worn year after year. The material feels nice in person and the dress is fully lined. I don't need anymore work dresses but wanted to share a quick pic. Ann Taylor: 50% select full-price styles and all sale styles. Couldn't find any of these shoes online but they're on crazy sale in-store. 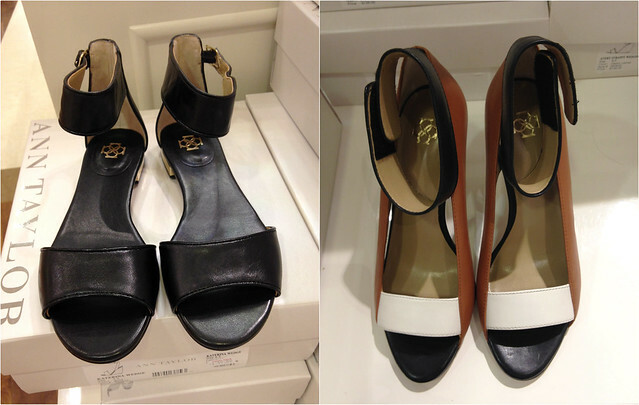 The left pair is $9.99 (saw a size 5 in my local Ann Taylor store). The right pair is $7.49. Keep in mind they're final sales. I posted this picture on Instagram but wanted to mention it here just in case you don't have an IG account. This jacket runs small (I am wearing a size 0P here). I loved the sleeve length and the overall length. However, the sleeves get wrinkled easily (see pics). The regular version is 50% off this weekend but the petite version is still full price. What's up with that? Express: 40% off every single item in-store and online. I tried these pieces on last week just for fun. The patterns are definitely too much for me. The set is adorable in person and fits really well. I even liked the longer length. Wish they had it it a more suble pattern. Same with the midi skirt, loved the fit but did not care for the zebra print (I am wearing a size 00). The jacket was just OK. It looks a bit cheap in person. Love these reviews Sydney! The BR moto jackets are SO CUTE. And I'm glad you talked about that Express moto jacket. I have seen it online (but haven't seen it in store) and thought about getting it for Labor Day but it was sold out in my size. Glad to know I'm not missing out on that as much as I thought. I also ordered the Express cuff you have since it seemed to fit you well! I'm hoping I'll have the same luck since I love the delicate styling! Thanks for the review, Sydney! 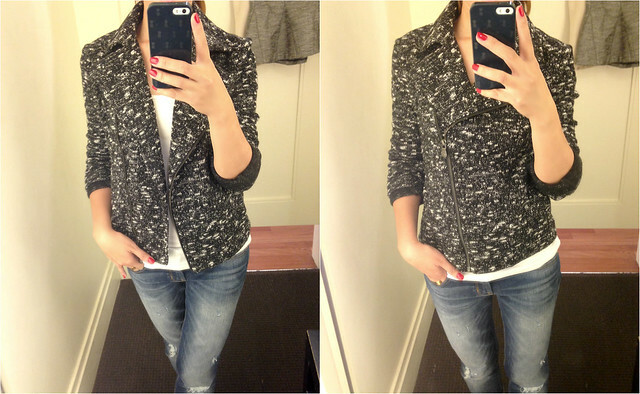 I've been eyeing the BR tweedy jacket as well. Did you order a 00P or a 0P? Which do you think will fit better given the size of 0? @Vicky Vicky, I ordered a size 00P. A 0R I tried on was a tad big in the shoulders.